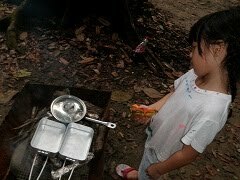 Our second camping trip, and today, Hui was better with living in the outdoor. I remember our first camping night, last October, she wailed whenever I put her down in the tent to sleep. The same thing occurred when I lie her down after she was sound asleep. As a result, I basically carried her in my arms till morning. We (our group of 6 adults and 6 girls, aged 2 to 6) camped at Zone 1, which is the nearest to the main entrance (guard house! ), approximately 300m away. Being a novice, I simply thought, nearest is the safest. After taking a stroll at this area, I felt that Zone 4 is the best of all, where the campsites are well raised up on a cemented platform and neatly tucked right next to the river in a row, with a barbeque pit on a stand. :) On the flip side, campsite is located by the road side and not surrounded by trees as in Zone 1. Zone 1, being nearest to the entrance, is a stopover for most day- picnicker. 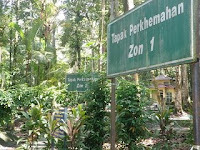 Campers at Zone 4 are permitted to drive their car in whereas at Zone 1, we parked our cars at the entrance. 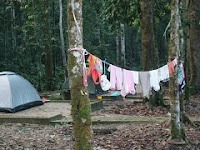 Campsite - RM10 per night/tent. 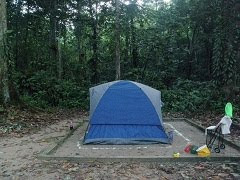 Tents are priced from RM15 for a 4-man-tent. 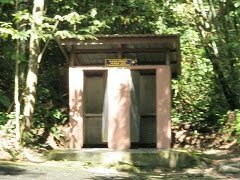 Toilet charges is 50cent per day for adult only. 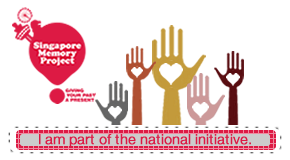 Entrance fee of RM1 (12 years old and above) is waived for campers. Tel - 03- 5513 2000. Left- Our tent. The first chosen campsite was abandoned as it was filled with red ants. Right- En packed her pink rope as clothes line, eagerly tied it around the tree when she arrived. It was moved higher by uncle So Chau. Left- Zone 2 is just a stone throw away from Zone 1. Zone 3 is opposite, up the slope. Right - The part of the river next to Zone 1. Left- The icy cold river water became the fridge. 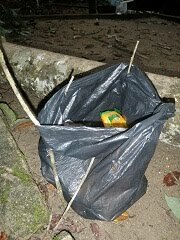 Right- I put a garbage bag on the ground and En made a stand with twigs. Pretty impressive. Left- Dad soaked in the cooling clear river..ooh aah and bathed with a bar of soap. En followed suit! I didn't bathe (yeah, smelly, dirty. No way, I am going to bathe in the river) and the moment I got a warm shower at home, waah, I was on a bed of roses! 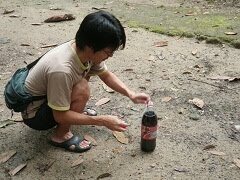 Dad did a coke-polo volcano experiment & the liquid shoot up in an instance! En was so dissapointed that Hui and uncle Kevin didn't get to see it. 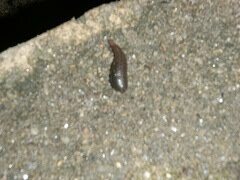 Right- The fat leech that had sucked Hui's blood. 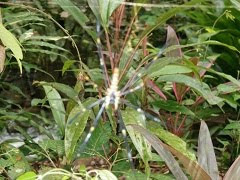 Right- A huge spider beside the plant with lots of spiderlings (left) .. ehm.. the mommy-spider? A leaf with lots of green dots on it - bit eerie looking. Beautiful funghi sprouted by a tree stump. 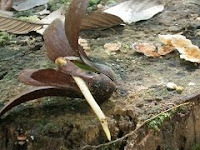 Dad showed us how the "meranti" seed could spinned downward graciously. 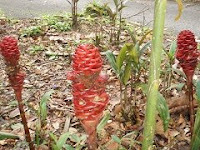 Left- Ginger plant. 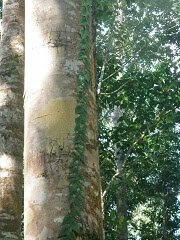 Right- The leaves creeped up the trunk and it looks as if it has been glued on it. 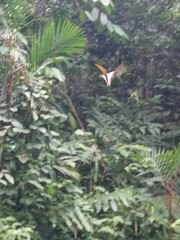 I could not spot a single bird but there were variety of dazzling butterflies, which I have not seen before. Dad built a small fire with a solid fuel. That attacted Hui, who kept picking up stick and leaves to throw in it. 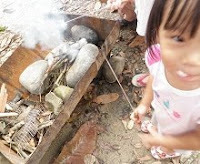 The kids couldn't get their hands off the pack of marshmallow, barbeque it with a skewer. En impatiently waited for the water to boil, before she could throw in the instant noodle. The heat was too much to enjoy, she gave up cooking and ran off. 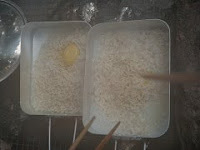 Dad cooked the noodles with egg and it was Enhui's FIRST instant noodle meal ! I was trying to overcome my guilt of feeding them instant noodle but hey, this is camping, isn't it ? 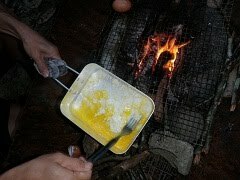 ;p The taste of food cooked with charcoal-wood fire was simply irresistible. I indulged in some sweet potatoes and corns. 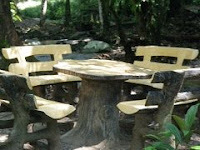 It is such a merriment, to feast under the trees, by the stream. 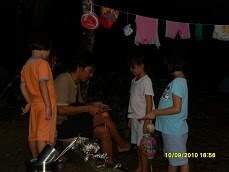 Dad helped, lighting up the lanterns. The lanterns created a splendid sight. At night, Abby spent the night at our 6-man-tent. Both En and Abby chatted and giggled under the sleeping bag. Hui was in between them. Finally, Hui rolled over to my side and dozed off. It was awesome, hearing En and Abby talked like old buddy and they were just 6 years old! Eventually, it was all quiet and En rolled over to my side and fell asleep. Abby was at the corner, snoozing away. The night was cooling and the sound of the stream and chirping insect took over. It calmed me down instantly and living outdoor wasn't so bad after all. 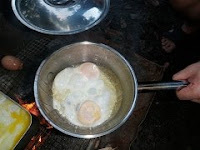 This is the morning eggs, over easy by uncle So chau and scramble, by dad. :) Delicious. Direction to Sg Congkak. - Cheras-Kajang highway, go through first toll. Take first left exit 702 - Persimpangan Hulu Langat. Follow the sign "Hutan Rekreasi Sg Congkak, Hutan Rekreasi Gunung Nuang, Air Terjun Sungai Gabai, Air Terjun Tekala"
There is nothing great about Sg. Congkak. I mean it is a normal stream, yes, is cooling and it is quite clean, shallow in most parts. And the river runs through the forest. And the campsites are among the trees and along the river. This campsite comes along with toilet and changing room and even street lights lining a narrow road but away from the campsite. But still, one can see the light from the campsite. 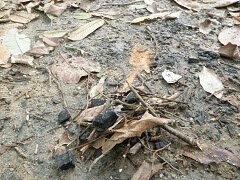 So is not your normal camp-out in the forest away from civilization, where you can;t even see your own hands after dark. But certainly, a great experience for a beginner, like us. Great exposure I felt for the family. Provided a good away-from-home feel. The cooking and eating sessions were a joy, I felt. There were 3 families including us, this time. The kids get to mingle around amongst themselves and with the adults too. A good mix. I thought, with a few families, one can introduce some team-work/building type of games into it, if there is a next time. I thought it would be great fun. that flower, that's a ginger plant. If I am not mistaken. oh my gawd the girls and you are so brave. I went there with the family, stayed for two hours and went home! I love the modern facilities way too much. 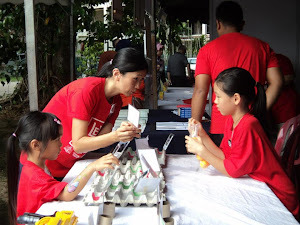 Hey can I know how much does homeschooling cost in Malaysia. Can you please tell me? we are doing it at home,on our own. I have not purchased any homeschool curriculum yet. 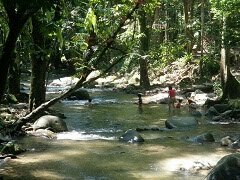 sungai congkak is a very nice place to visit!